Within the framework of its continued endeavours in the area of community service, Pharos University, in coordination with the Education Directorate in Alexandria, organises two medical relief convoys to “Martyr Mohamed Shaheen” and “Al Bakatoushy” schools on Monday 19/2/2018 and Tuesday 20/2/2018. 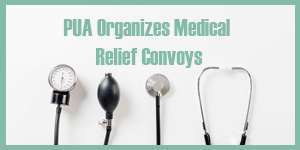 Some delegations of the faculties of Dentistry, Physical Therapy, Allied Medical Sciences and Languages and Translation will participate in the convoys to offer the students free medical examinations, provide them with the necessary medical supplies and raise awareness about health issues among them. This is held under the supervision of Prof. Ramadan Abu El-Ala, the Vice President of Community Service and Environment Development Affairs.